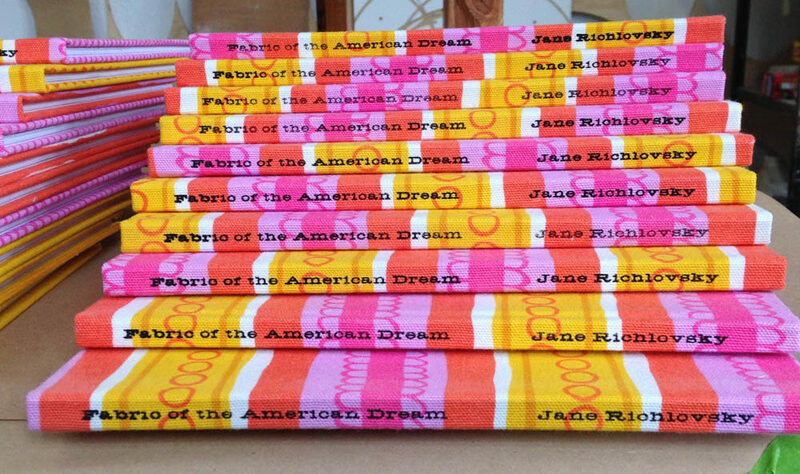 In 2015 Chatwin Books published Fabric of the American Dream, a combination monograph (of my Manet covers) and meditation on some of the recurring themes in my work. Chatwin co-founder Annie Brule, who had been a tenant of my ’57 Biscayne studios from its inception, and I had been wanted to collaborate for a long time, and this seemed like the perfect project. Annie is an illustrator, map-maker, and book designer who specializes in art books. She and Arundel Books owner Phil Bevis founded Chatwin a few years ago; Fabric of the American Dream was the first in their artist series. On Phil’s advice, we produced the book in two editions: a clothbound limited edition, and an unlimited paperback edition. Both versions have identical content inside. I wanted the books to reflect my psychedelic homespun aesthetic in their form as well as their content. When I hear the word “clothbound”, I’m not picturing some tasteful, plain, dark, smoky, brown number. I’m thinking more along the lines of something I’d use in a painting. The problem with vintage fabric is the difficulty of finding a sufficient supply to do all fifty covers. (Besides, I need it to use in my paintings.) After some searching, I managed to find some brand new fabric that gave off the right mid-century vibe, so I snagged what was left of the bolt. I consulted with some crotchetty old guys in the midwest who had been binding books for forty years and knew their stuff. They initially tried to scare me away from the idea of using just any old cotton cloth to bind my books, but after I badgered them a bit to tell me what exactly real bookcloth is, they relented and allowed that I could add a stabilizer to the back of the cloth and it would probably work just fine. They were a bit tight-lipped about what that stabilizer would be, so I badgered some crotchetty old ladies here in town who had been in the crafty-fabricky world for just as long, and they, along with some younger artist bookbinders on the internet, recommended an iron-on product called “heat-n-bond”. Due to some delays and miscommunications at the bindery, we nearly didn’t have any books for our projected opening. The production binder who bound the softcovers and the innards of both editions was unable to add the cloth covers, let alone print titles on them. Some panic ensued, but we found a smaller house to do the binding, and I decided to tackle the titles myself. I burned a screen in the same typeface that Annie used on the printed softcover. Screen-printing the front cover was easy enough, if a little nerve-wracking. I had exactly 50 of the cloth books to work with; I was committed to having 5o perfect (non inkstained) books when I was done. To print the title on the spine, I came up with a little contraption on the fly, cutting a book-width slit in a board and adding some book-height legs to it. Slide the book in, lower the screen, squeegee the ink across it, and presto! Earlier in the process, when cutting out the bookcloths, I had been very, very careful to use every square inch as economically as possible so I’d have some cloth left over. I spent the day of the book release at home in my sewing room, being just as frugal with the remainder of the cloth, and I managed to squeeze out a dress. Because if it is at all possible to match your publication, why on earth wouldn’t you? The hardcover edition is entirely sold out, but the delightful Brule-designed softcover is available through my brand-new store page.